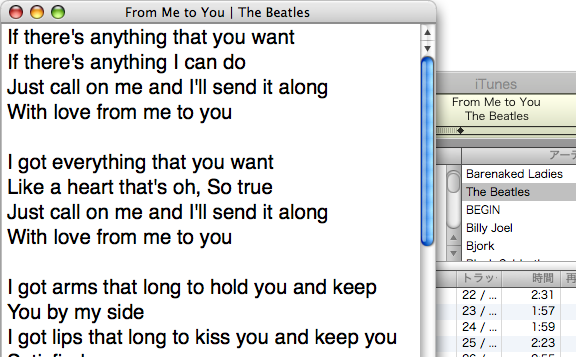 Lyrics is a very simple piece of software that just shows the lyrics that iTunes is playing in a window. It never bothers you with needless functions. The package includes the source code so that you can modify it by yourself. 9/30 v1.4 Supported MacOSX Mojave. 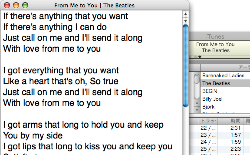 Lyrics is freeware. There is no limitation to use this software. Please note that the author takes no responsibility for any damage caused by the use of this software. 18.09.30 1.4.0 Supported MacOSX Mojave. 07.12.08 1.3.0 Added feature to edit and save lyrics.